DRM is part of the MF and HF bands today, albeit with a most uncertain future. Actually I bought a DRM license from Winradio back in 2007, to test with the SDR-IQ and later the Perseus. My trials were disappointing - I needed almost 20 dB SNR to decode, and another 5 dB to get stable reception. Not to mention the sound card problems. With the Excalibur I got decoding at around 15 dB SNR, and stable reception at around 18-19 dB. DRM with the Excalibur is very much plug and play, if you chose to install the DRM player when you installed the software and driver. So, if you enjoy DRM, and you have a DRM license (or are willing to pay USD 50 to buy one), the Exalibr provides an excellent platfom. The illustration is from 13810 kHz at 1200 UTC. I needed to do some cosmetic changes, but also some regarding content. Errors are corrected, and a further discussion regarding the Excalibur's DDC recording capability has been added. The download link is the same. I thought it was I who had done something wrong, some time ago when I didn't get a DDC recording to play back properly. I kept tuning up and down, but was still listening to the same signal. Well, I hadn't. 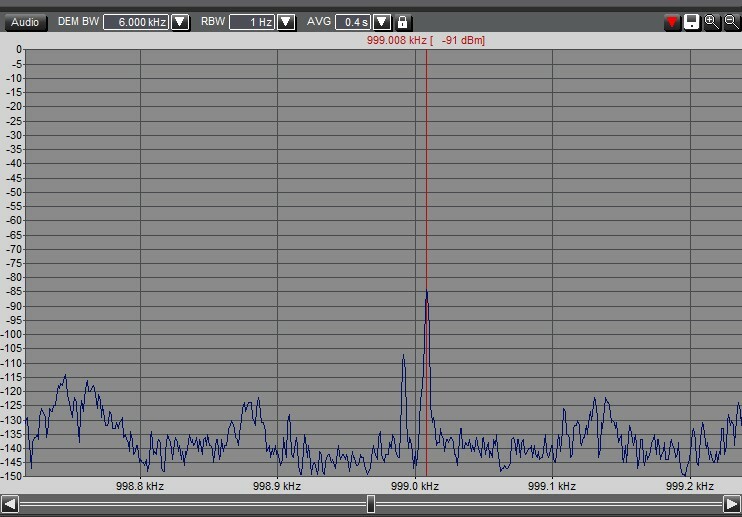 The thing is that there is - for no obvious reason - no reference or connection between the frequency range of the DDC recording and its playback. If you don't choose the "Insert freq" option when you record, you will not be able to play back the file with the correct frequency. And should you remember where you were during recording, you can "tune" only by clicking in the DDC or Demod spectrum - something that at best will be most inaccurate. So, if you want to make a DDC recording, and play it back the way you play back a Perseus, SpectraVue or Winrad recording, you MUST choose "Insert freq". Now, I agree that in any case, it would be wise to put the center frequency of the DDC recording in the file name. But, when other vendors manage to get this connection right automatically, why can't Winradio? Who wants to make DDC recordings without being able to track the signals properly on playback? It is sort of ok when you're aware of it, but it does increase the risk of making a useless recording. Excalibur: What Is Really Its Minimum Resolution Bandwidth? There has been a discussion regarding the Excalibur's ability to accurately measure a station's excact frequency, down to the hertz. Well it can, provided it is correctly calibrated, but not on every DDC spectrum! In fact, for nine of the 21 available DDC spectra the minimum resolution bandwidth of the Demodulation panel is 2 Hz, not 1 Hz. 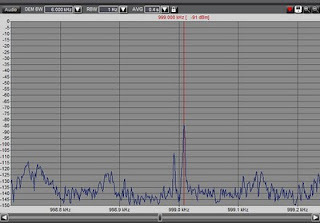 The best demodulation resolution is available for these DDC spectra: 20, 24, 32, 64, 125, 160, 320, 640, 800, 1250 and 1500 kHz. When you record a DDC spectrum, it doesn't matter which RBW the Demodulation panel is set at. If it is set at, say 160 Hz during recording, you will still be able to see 1 Hz during playback. Many DX-ers (MW DX-ers in particular) are concerned about the Excalibur's ability to show the exact frequency down to the hertz. While most SWLs will be indifferent about this, quite a few are monitoring a station's offset from it nominal frequency, and it is also helpful for tentatively ID-ing stations (assuming their offset is reasonably constant). By zooming in the demodulator panel and by using 1 Hz RBW, monitoring offsets is indeed possible, as illustrated above. Two stations are visible (and audible) on this screen dump from 999 kHz, a Russian-speaking station on 999.008, and a presumed Arabian station on 998.992 kHz. Prior to monitoring, I calibrated the Excalibur using a tone from the signal generator on 1000 kHz. Of course, in order to monitor offsets in the range of 1-5 Hz, the readout must be exact. When the Perseus and the Excalibur are monitored side by side, the Excalibur's S-meter consistently reads 6-8 dB lower than the Perseus. One might be tempted to believe that the sensitivity is lower. Well that is not the case. More on that later. In terms of sheer numbers, the Excalibur is the most sensitive SDR I have measured, with a good 1uV sensitivity throughout most of the MW and SW spectrum. So why does the S-meter read much lower than the Perseus? It is apparently not calibrated. When I fed a -107 dBm signal from the signal generator to the Excalibur, the S-meter read -115 dBm. This is roughly consistent with the difference between the Perseus and Excalibur S-meters. Update July 20: Martin Kent at Winradio suggested that there might be a bug in version 1.06 that caused the erroneous signal level readout, and asked me to check the signal level with version 1.10. Indeed, the difference between the signal generator at Excalibur was reduced to 3 dB. My signal generator may not be 100 % calibrated, so I have no way of saying if the signal generator or the Excalibur was correct. Or any of them. Now, for those who want to compare Perseus and Excalibur recordings, I have uploaded two 1 MHz recordings with 6120 kHz as center frequency. The recordings contain a lot of static due to nearby thundershowers, giving their AGCs something to work on. The signal levels aren't too high, with the exception of semi-local Murmansk 5930. This should be a good opportunity to compare selectivity. Got it on Wednesday evening, July 7th. I ordered it with Waters & Stanton on June 20nd, and received confirmation on same-day despatch. However they didn't send it until I made an inquiry nine days later. The question why it took so long remained unanswered. Anyway, I was lucky enough to be able to buy from the first batch of receivers sent to Europe. Thanks Tracey Gardner for alerting me. The Excalibur came with a 12VDC linear power supply, a proprietary USB cable and an SMA-to-BNC adapter, rather fragile in appearance in fact. Surely, nobody uses SMA connectors for their HF receivers??? A comprehensive (107 pages in fact) user's guide, based on the Excalibur software help function was also enclosed. The hardware is more or less identical to the other Winradio receivers. The footprint roughly equals that of the Perseus SDR, but slightly taller. As I learn more about the receiver I will post some theme-based impressions on the blog. More as it happens.